Yaesu FTM-400 is equipped with a color touch screen with a diagonal of 3.5 inches, and works both in analog AM / FM modes and in digital C4FM. Automatic mode selection allows you to determine the type of the received signal and instantly switch to the corresponding mode of operation. 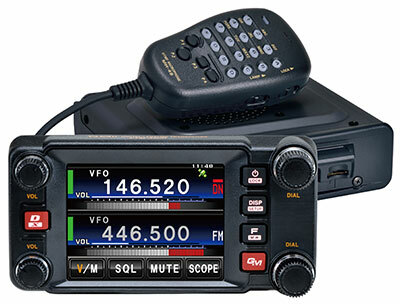 C4FM radio Yaesu FTM-400 is capable of receiving frequencies from 108 to 999 MHz. The transmission is carried out in VHF and UHF: 137-174 and 400-480 MHz with an output power of 5, 20 and 50 watts. The Yaesu FTM-400 has an excellent sensitivity of 0.2 mKv at 12 dB SINAD. Support for digital communications, GPS global positioning, APRS capability will significantly expand the scope of this WIRES-X radio station, and the touch screen allows you to control the radio conveniently and simply. Built-in Yaesu FTM-400 GPS-module will help to establish the location of the radio station and transmit this data to the interlocutor, showing the direction and distance between the operators. All user-set parameters, used frequencies and photos taken with the separately purchased MH-85A11U are stored on the MicroSD card. Photos can be viewed and sent over the air. In C4FM, the Yaesu FTM-400 radio has a pager function for calling only certain stations. It allows you to make individual calls. The radio station has a graphical spectrum analyzer with signal level indication.